1. President Moon Jae-In of South Korea, Please stop the torture and consumption of dogs and cats in Korea. 2. Minister of Justice Mr. Park Sang-Ki: please enforce your laws to protect all of Korea’s companion animals from the horrendous meat-trades and cruelty. Photo: The Korea Observer. 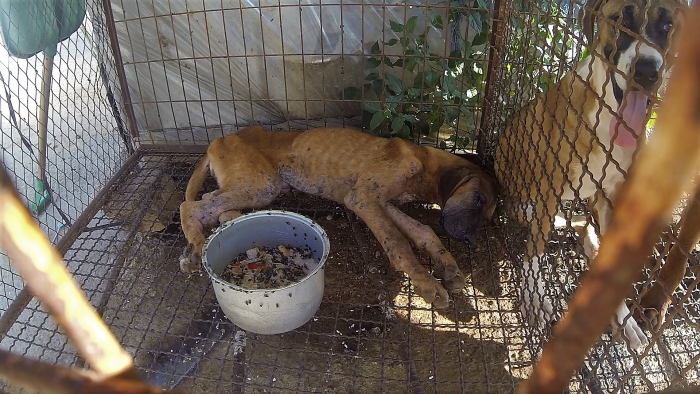 Documentary: The Dog Meat Professional – South Korea. Dogs need protection like any other animal. They do not deserve to be tortured and killed in these inhumane ways. It needs to stop NOW. My God, what kid of BARBARIC SAVAGES can do this!!! May they all suffer and die the way they kill tge dogs and cats!!! BOYCOTT CHINA AND ALL ITS PRODUCTS!!! This is the best way to deal with this barbarism.vote with the purse. I agree that dog-eating countries must face a total boycott, and China is number 1 in this list, but this article is about South Korea. By the way, I’m sure they do the same in North Korea too, but we receive no information from there because of total censorship there. Anyway, no “made in China”, no “made in South Korea”! Dogs are not like farm animals. They have been trained and bred through centuries to trust and rely on humans and we should not betray that trust but need to act as the guardians that we should be and not eat these highly intelligent and loyal animals. What kind of heartless barbarians South Koreans are. The world looks down on you with disgust. How can you keep a dog as your own personal pet while you allow th rest to suffer in the dog meat trade torture? We hope you all burn in hell as you deserve. All of this madness MUST stop! PERIOD! End of story! NO, NO, NO, to killing of dogs and cats, kittens and puppies. Don’t care if people need to make a living. DO SOMETHING ELSE, AND MORAL, FOR A LIVING!!!!! Please escalate this matter to the concerened authorities and stop refraining from responsibility, what do you call beating animals on thier head and violently killing them, torturing them while suffering all their lives from the moment they are born!!! Isn’t this alone a violation to article 8 of the animal protection act. Your words and responses are so contradictive to what you have mentioned and to what the law has constituted. I am so sickened by the inhumane treatment of innocent animals. The Korean’s and Chinese that allow this are sick and demented. I will not, and will never, purchase or travel to these countries for this very reason. Simply heartbreaking…clearly they have never had unconditional love in their lives. No animal should be born into the hell that is South Korea. Your people are sick and demented, don’t know how any of you can live with yourselves. I will never buy products from or visit your so-called country. You need to learn your facts. I am an American and I live in South Korea and it is a beautiful country. They have some very old fashioned beliefs and have had a very fast progression to the modern age. Give them time and they will learn. Calling them names will not help, you need to be understanding, and also know that this practice is going out of use already. I teach children and none of them eat dog or cat. It is old fashioned to them and they think it is sad, too. Don’t spread hate, spread knowledge. I have read the same thing as you say. Dog eating is present, but is slowly being phased out. Unfortunately, this will take some time but in the meantime, advocacy groups are working with Korean dog farmers to try and teach them otherwise. That said, what do you as a resident there think is the best way to expedite this process? BTW, China is absolutely on another level as far as inhumane treatment of all animals in general. This is an absolute modern country, even surpassing the U.S. in some ways, but absolutely medieval in other ways that is hard to comprehend. Unfortunately, there is almost nothing we can do as U.S. citizens to change their behavior, as they will soon be surpassing us as the #1 world superpower and not give a damn what anyone else thinks or says. They own perhaps a trillion dollars of our debt and we are inextricably connected to them in more ways than we know. IMO, advocacy and pressure should continue worldwide against China and perhaps just as importantly, internal animal rights groups and groundswell and growing advocacy by the newer generations is necessary to really change things going forward. For now, China owns us and they really dont care what we think. Süd Korea, China und andere asiatische Länder sind jeweils die Hölle auf Erden für hilflose, leidensfähige Mitgeschöpfe! Vor allem in Süd Korea leben viele Katholiken, die einmal überlegen sollten, welcher Gott denn solch ein Barbarentum, Grausamkeit und Folter an hilflosen Tieren dulden würde. Man kann es nicht glauben und hält es nicht für möglich, wie verantwortungslos, abgestumpft, grausam, brutal, mitleidslos und unmoralisch alle Beteiligten sind, das fängt an beim Züchter, Händler, Transport, dem grausamen Schlächter und endet beim ignoranten und verantwortungslosen Konsumenten! Länder, in denen einen solche Menschen Angst einjagen und in ein Trauma versetzen. Für Menschen mit Herz gilt: Kein Erzeugnis aus diesen Ländern erwerben und kein Urlaub, denn diese unmoralische und ethisch verwerfliche Tötungsmaschinerie kann und will man nicht unterstützen! Are humans going backwards? Are humans becoming more and more barbaric? We are suppose to be the age of modernity but I do not see that coming from the Asian countries, animals are tortured and assassinated for greed and selfishness. From what we see, asiatic communities have no feeling for suffering animals, on the contrary they take pleasure in torturing them. It is a disgrace for the human race, stop this nonsense. I wish everybody would boycott China products until this horrible practice is stopped. This practice has no place in the world in this day and age. I agree 100%!! And this evil and barbaric practice is happening worldwide!! Please help all that are trying to hard to help those who cannot help themselves. These precious beings deserve to be loved, adored, and certainly not consumed as a meal!! Thank you. Dogs and cats are not livestock. They are beloved pets and companions. Their continued slaughter and consumption at your country’s hands horrifies, disgusts and angers the whole world. I completely agree….the entire world is watching in horror. You should be ashamed…. The torture of any animal is so disgusting and unnecessary. There is no medical benefits from eating dogs cats or other animals. We look at your behaviour all over the World and think it is barbaric and because of this then think what horrendous people you are . I will never visit your Country or buy anything from South Korea until you stop this behaviour. STOP THE DEPRAVED, SADISTIC, MONSTROUS, SAVAGE TORTURE AND SLAUGHTER OF DOGS AND CATS!!!!!!!!!!!!!!!!!!!!!!!! Your ‘Animal Protection Act’ needs to be updated to not allow dogs and cats for human consumption. They are companion animals and should be treated as such with more respect. Stop this cruelty please,nasty people and there. what is being done to dogs and cats in South Korea goes beyond all understanding ! I am shocked terribly by the fact that a country like yours can be so cruel ! !that the man can be so bad !! so horrible !! on my behalf I boycott everything your country produces and even if I have the opportunity to visit your country, I will never do! how can we admire a country that tortures dogs and cats so much !!! South Korea is the champion in the torture !!! The killing and eating of any animal is a barbaric practice that should be condemned by all civilised people. However the hunting of animals and killing them for so-called sport is even worse. It will be many generations before the human race even starts to be civilised. And to those that don’t know, China and south Korea are two totally different countries. China provides fur for western countries by skinning cats and dogs while still alive. If people in the west stopped buying fur, that would cease. Non acquisterò mai più un prodotto coreano finché continuerà questa barbarie! Non meritate di essere considerati partecipi del consesso umano! 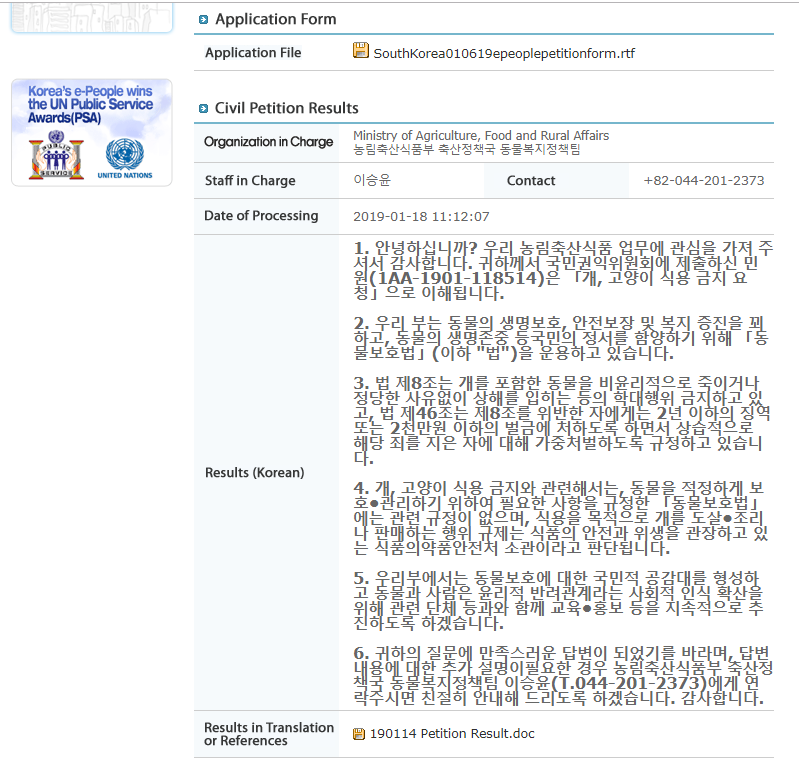 This is criminally insane and uneducated, furthermore, Korea can’t hide this evil any longer. Must be the CRUELEST NATION on earth, don’t just pass the responsibility onto other people, do something, anything to stop these despicable acts of barbaric cruelty. Drag your nation into the 21st century, The world is watching & waiting for you to act NOW. We will spread the word and boycott your nation until your cruelty stops. No country can call themselves civilized sanctioning sadistic cruelty to animals. Anyone participating and condoning these heinous crimes of sadistic torture of animals are a disgrace to humanity. This is NOT how humans conduct themselves and still call themselves humans! We will not buy anything produced in your country, nor will we visit South Korea as long as this sadistic torture of cats, dogs and other animals continue. We will encourage our families, friends and coworkers to follow our lead! Shame on you! To subject living sentience beings for the sadistic torture you do south koreans, says everything about you. You have lost face as well as having no honour! You are a disgrace to humanity! Will not buy South Korean goods until animals are respected and not abused. The lack of trade will persuade. The government should promote other, non cruel money making jobs. Enough is enough. How can any civilised person inflict this kind of torture & pain on another living thing ??? PLEASE make sure your laws are adhered to and put a STOP to this barbaric behaviour! Sorry, but there are ‘fluffed over’ words in that response. Also, a ban on eating dog and cat meat should be the overall aim, but in the meantime and with immediate effect these animals need to be kept in better conditions/enclosures where they have more room to roam. They should not have to live with disease and in fear. Above all, and I know it is not a solution, but they should have a great free death. Torture and fear should not be part of the process. stop this horror and no compassion I never will come in this country of barbaric people ! These people will get treated exactly like they are treating these animals in next life! The devils waiting, Have fun A’holes. this is the most hideous form of animal cruelty… torching, beating boiling skinned alive….. ASIA< YOU ARE A DISGRACE TO THE REST OF THE WORLD… stop eating dog and cat and all the horrendous other things you do to animals… I have boycotted your country and never never will buy from you filthy country again!!! Dogs and cats can be, if not at all, someone’s pet, best friend, and companion whether they were taken away from an owner or found on the streets as strays. They are not food for people’s consumption. You cannot morally claim to protect animals at the same time allow them to be eaten. You say one thing and do another. 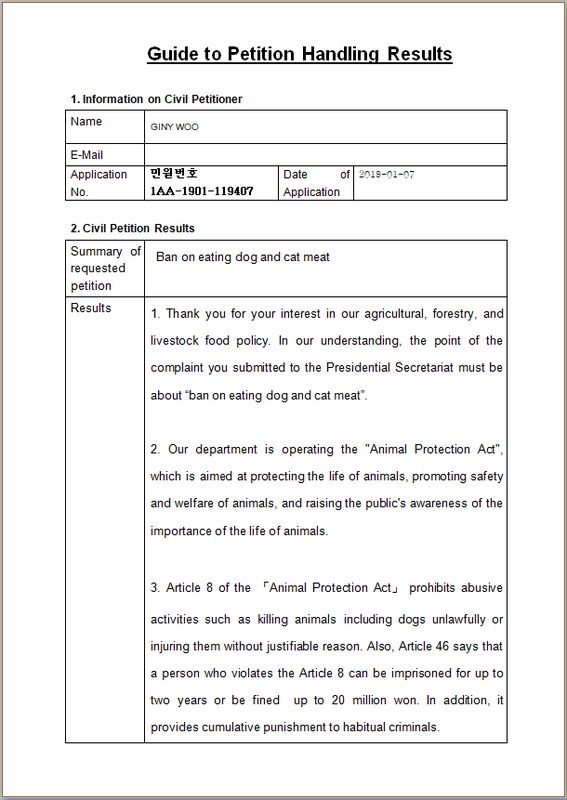 You claim to have “Animal Protection Act” yet say there is no regulation on eating dogs and cats. This is nothing but rhetoric nonsense designed to confuse us into believing you are ethical and yet, at the same time, waver to do the opposite. Instead of following your principals of promoting as you claim ”human animal relationships as ethical companionship” you allow the torture and killing of potential pets as food for your own consumption. This is wrong. I am shocked that country such as yours is capable of such a cruelty and has so little regard for all God’s creatures. Do the humane thing and stop your current practices. It doesn’t matter how many technological advances humans achieve if we don’t learn to respect life in all its forms. Animals were not put on this earth for us to torture. That not only includes cats and dogs but all animals; WE DO NOT OWN THEM. We should be ashamed of what we do to other species that deserve to live on this planet as much as we do. If we keep this way we will destroy it, not doubt about it. Animals DO FEEL PAIN. Particularly cats and dogs, they have personalities and even are aware of themselves and their environment. It has been proven by numerous studies. I considered South Korea an advanced country, but I see now that they have a long way to go. What a shame! The Korean Ag, Food and Rural Affairs department need to BAN these Dog Farms that raise dogs, torture and kill them for eating. They are NOT starving in Korea!! Not by any means! This barbaric behavior is a travesty that must END … and END NOW. I’ve seen the video’s of how these domesticated animals are “tortured” – clubbed over the head, blow torched, etc. What kind of CIVLIZED country permits this sort of thing???? Time for Korea, and all the other Asian countries to join the 21st Century! If you prize your country as one of culture, futuristic vision and care, you should care about the lives of animals that are not supposed to be eaten, after being tortured, and cruelly killed by the worse means. Please take a step forward and help dogs and cats. This is the right thing to do. This is the most barbaric, inhumane and cruel practice I have ever seen in my 61 years. Isnt there any human kindness in Korea and China? Cant there be any compassion for these smart and friendly animals? These are best friends and companions you are doing this too. I am boycotting anything made in Korea or China until this cruel, mean practice stops. Please stop hurting them! This is beyond cruel and barbaric. It’s beyond heinous. No excuses. This has to STOP. NOW! 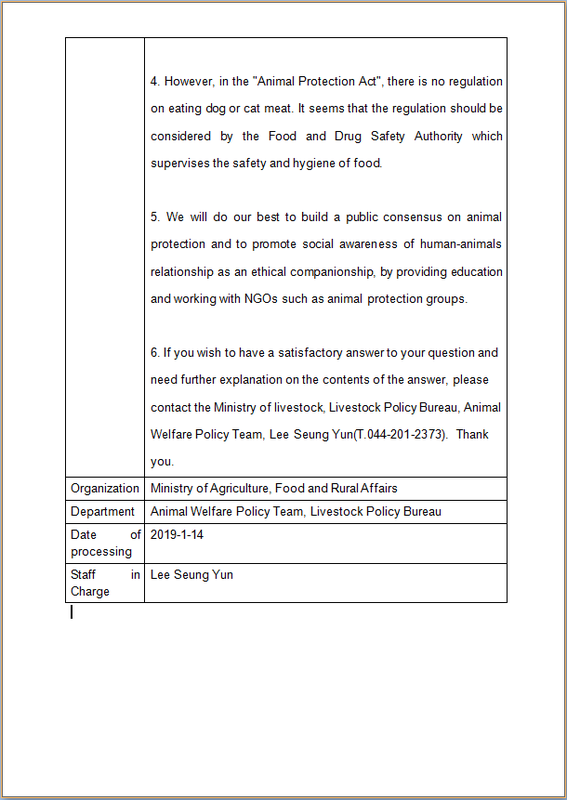 This response from the Korean dept of Agriculture shows how poorly and inefficiently the complaint has been handled…You collect all this money from us to help the abuse the cruelty and torture and you do not channel it the right way, so they brush the petition under the carpet and continue the cruelty and torture. It is really a shame and extremely unfair. Just not right, that you pad on the shoulder and believe you do great. You do not. This is beyond disgusting! Have you people no compassion? First off, they are wondering companions(cats and dogs) and the way you people kill them is beyond sickening. Its devilish behaviour and with no remorse at all is beyond comprehension! Shame on your nation! Skinning them alive, boiling them alive, electrocuting them, hanging and beating them. SHAME!!! destruction of life on earth ? There is not a silver bullet that will liberate these helpless creatures from the true hell they live in. There are options, but NO single solution. The younger generation is more sympathetic towards animals. Proper education from very young age will definitely change many wrong attitudes. Governmental sanctions and control of the animal rights laws will be extremely helpful. Pressure through the social media is slowly exposing and putting a dent into the cruelty of these barbaric nations. We need to do our BEST to apply pressure and demand help from as many public and private sectors as possible, in order to slowly but surely help the helpless obtain their fundamental rights to their liberty and freedom. Stop this barbaric practice! Dogs are trained to be domesticated animals who help, guide, and comfort people. They are treated like family. I will boycott any product made by your country. Please stop the torture. It is so cruel. Who will ever respect Korea and Koreans when you cause so much suffering? I am boycotting buying any goods from both China & Korea. As a nation We should take time to Remember each of our purchases from these countries contributes to these countries economy and pay barbarians in wages to torture and kill; in the worst inhumane barbaric practice ,on defenceless cats and dogs. Whilst these animals starve in horrific cages they also witness the noise and the torture and smell of boiling flesh which continues to be inflicted on these wonderful animals. If we all join in and boycott buying goods from these countries, they may have to take note that we care more for our animals than seeking cheaper purchase from these countries which inflict pain and show no remorse or compassion to these animals. As compassionate people most of us open our hearts everyday and see our cats and dogs As a joy and companionship,. who allow us to love them and enjoy life with them, which enlightens our lives. Surely there must be some animal lovers in Korea and China and other countries that can show compassion and have a voice and stop and educate others to seeing these amazing animals in a different light , NOT DINNER ON A PLATE and say STOP THIS NOW. Please STOP!!! It’s terrible to see how dogs and cats or eaten by Koreans. These animals are there for you when your feel lonely, sad etc. and they could scent it, which they come by you to comfort you. I’d like to know just who you people think you are?? This is utterly disgraceful and completely unnecessary to, not only eat these poor defenseless creatures and cage them in constrictive holdings, as pictured, but to torture them at your will and actively participate in their suffering!! Do you enjoy seeing such barbaric, draconian, savage, cruel acts handed down to creatures unable to help themselves? Do you wonder why the world deems you a third world and unworthy of being considered a democratic, safe forward thinking nation? I’m quite sure some of you people have enjoyed the comforts a dog or cat can offer to humankind – the loyalty and love such animals offer in return for very little. I wonder just how you would feel upon seeing your beloved dog or cat, perhaps from childhood, being skinned alive and unnecessarily tortured before finally being allowed to die a long suffering death…..but i suppose that’s ok, so long as it isn’t happening to you or your children’s beloved pets….that’s a different matter, i suppose. Hopefully one day, you too, will feel death’s keen sting in the same long suffering manner with which you so keenly and eagerly dole out to these poor animals and will, at that moment know the same pain then realize that nobody will be coming to put an end to your suffering, that it will be prolonged and unmerciful. I wonder why there is so much evidence of abuse is found by people and/or animal rights organisations but Korean Police can’t find them??? The people that can treat another cruelly are going to suffer cruelly themselves – their acts, if their intention is to cause suffering, will come back to their side and be suffered by them, in exact measure to the amount of cruelty they give out. This is their karma, and it is one of the Spiritual Laws underpinning our development. If they, or indeed anyone, could see that every single intentionally abusive act will come back to roost at its origin, perhaps things would be different. But they are not spiritually advanced people that do these things, or eat the results of this cruelty, so that is why others, more evolved, must try to petition on behalf of these, and all cruelly treated animals.